Scottsville Texas and Scottsville Cemetery. 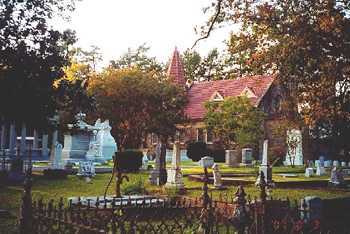 A view of the Scottsville cemetery and chapel. Scottsville�s population was reported as 300 in 1929, as 50 during the Great Depression, and as around 260 by 1950 - which is just about where it stands today. Scottsville still has its post office (granted in 1869) and ten businesses. Scottsville is a dispersed community with no discernable center. The main attraction to the town is the cemetery. 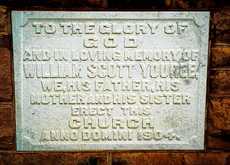 The Scott family remembered their dead monumentally and the volume of artistic memorials makes one think that they may have kept a stonecutter/ sculptor on the payroll. The Rose and Scott families joined each other in marriage prior to their arrival in Texas. The Yourees, Austins and Randolphs came later. The repetition of names in the cemetery would confuse all but the most knowledgeable genealogist or family member. 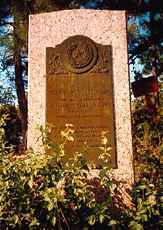 The town was named after William Thomas Scott, who moved to Texas from Louisiana in 1840. That year he built a plantation home, based on the plan of Jefferson Davis� Biloxi, Mississippi home of Beauvoir. *(See Forum below.) Prior to the Civil War he was the largest slaveholder in Harrison County. The Scotts also built a school and volunteered the services of the family governess to teach the local children. During the Civil War the plantation provided provisions for Confederate troops. The cemetery displays a Confederate monument that is much larger than many found on courthouse lawns around the state. 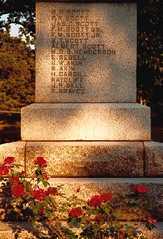 The Scotts involvement in the war is reflected in seven of the names inscribed on the pedestal. Many of the others were relatives. 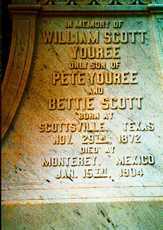 The church at the cemetery was erected by the family of William Scott Youree after he was killed in Mexico in 1904. 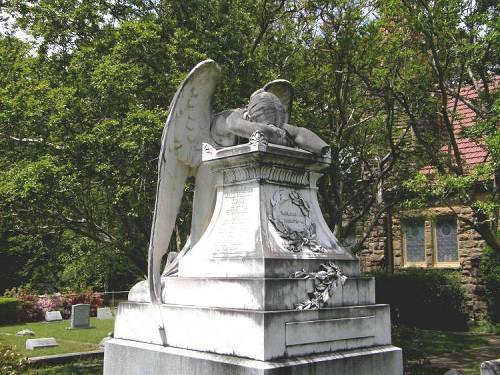 The weeping angel that marks his grave has become a popular regional photographic subject. It bears a striking resemblance to a memorial for a Hill family member in Houston�s Glenwood cemetery � even down to the missing hand. 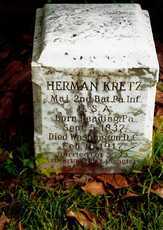 On of the smallest stones in the Scottsville Cemetery is that of Major Herman Kretz � 2nd Battalion. Pennsylvania Infantry U.S. Army. A Yankee. 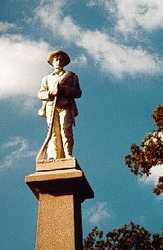 It�s 18 inches of height would pales by comparison to the 50 foot tall Confederate monument. The fine print reads: Barried [sic] Lot 3593 Arlington National Cemetery. That probably makes everyone happy. The only reason it appears at all is that it is placed alongside his wife�s tombstone. The Scottsville Cemetery is one of the most picturesque in Texas and is worthy of a trip � even if it takes you out of your way. The histories of the families demonstrates the closeness and inter-dependence that existed between pioneer families in the early development of East Texas.